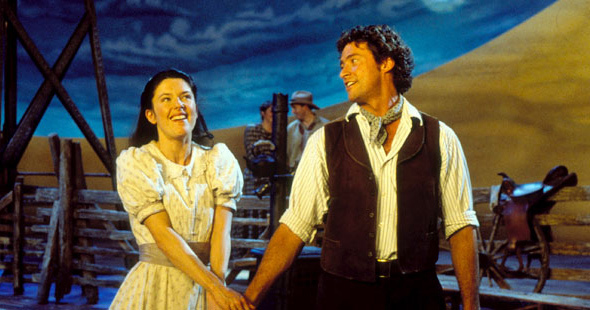 Still “doin’ fine” after 60 years, Rodgers & Hammerstein’s landmark American musical “Oklahoma!” is reborn in this film version of the Royal National Theatre of Great Britain’s award-winning production. Directed by Trevor Nunn and choreographed by Susan Stroman, it set box office records during its run in London, and again on Broadway, with critics and audiences alike captivated by its fresh new take on a venerable classic. Luckily for television audiences, the magic of the original London cast was captured in a deluxe film adaptation just prior to the show’s move from the RNT to the West End; it includes a sensational, star-making performance by X-Man Hugh Jackman as Curly. Also featured are original cast members Josefina Gabrielle as Laurey, Maureen Lipman (THE PIANIST) as Aunt Eller, and 2002 Best Supporting Actor Tony winner Shuler Hensley as the menacing yet hauntingly sympathetic Jud Fry. Special funding for this program was provided by Daimler-Chrysler and the Irene Diamond Fund.